I may slip up from time to time and commit the crime of using the terms “girls” and “ladies” to describe women. I know that this sort of thing gets up some people’s noses but if I do indeed commit such a heinous act please rest assured that I'm not seeking to offend or patronise – and I hope the fact that many women’s rugby teams refer to themselves as “Ladies” will get me out of hot water on this one. when I’m not blogging here or attempting to scratch out a living, I manage the Women’s Rugby Review, a blog designed to pull together women’s rugby news stories from around the world. Why, I hear you ask, would a bloke with no prior knowledge or interest in women’s rugby be putting time and effort into producing a blog dealing with women’s rugby news? The answer’s fairly simple. Back in February I was looking for information about the Women’s Six Nations and there was precious little being reported and what was being reported was scattered around the official sites of the applicable governing bodies. 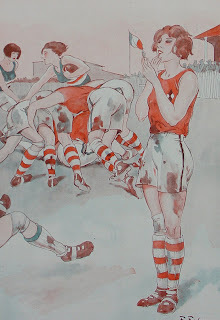 It seemed to me that there was nowhere where I could go and keep up to date with what was happening with the game as a whole – hence the need for the Women’s Rugby Review. Once I’d started pulling together stories from around the world I discovered some excellent blogs dedicated to the women’s game. 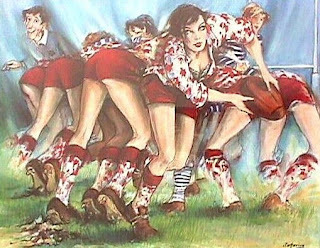 Saturday’s A Rugby Day appears to be the gospel as far as the US game is concerned and, together with Your Scrumhalf Connection, provides an interesting insight into the life of female rugby players in the States. Meanwhile, on this side of the pond, John Birch’s excellent Herts Women’s and Girl’s Rugby site and his award-winning Letchworth Girls’ blog appear to set the standard. As to the level of play in the women’s game, I’m hardly in a position to judge. From the little I have seen however, and in particular regarding the international game, the levels of athleticism, fitness and technical skills are impressive. That the game is underpowered when compared to the men’s game is obvious and inevitable, but does not necessarily detract from the spectacle. However, what has really struck me about women’s rugby is the passion and enthusiasm that it engenders. I’ve touched on this in another posting, but I’m certainly of the opinion that the fact that women are (or to date have been) relatively late starters when it comes to taking up the game means that they absolutely pour their hearts and souls into it – a feeling (in my first draft of this I used the word “vibe” but couldn’t bring myself to go with it) I’ve picked up, both from what I’ve seen and read on the web and from the women I see who turn up each week to play touch rugby. All in all I’d say women’s rugby has a very healthy future and my goal next season is to get along to watch and see for myself. I’d certainly have no hesitation is taking my 6 year old daughter along if that’s what she wants. thanks for the love. glad to see that we are a formidable opponent in your book. keep up the good work! 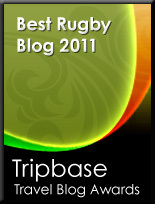 http://damenrugbycharm.antville.org - my blog and http://frauenrugby.wordpress.org - our boards own blog.